cEsaote S.p.A. (L.F.), Firenze, Italy. BACKGROUND AND PURPOSE: The hypothesis that MS could be provoked by a derangement of the blood outflow from the brain has been largely discredited. In part, it was because data on the normal pattern of outflow are scarce and obtained with different methods. The aim of this study was to evaluate the normal pattern of outflow for the vertebral and internal jugular veins in healthy subjects with multigate color Doppler. MATERIALS AND METHODS: Twenty-five volunteers were studied to assess vessel area, mean velocity, and flow for the vertebral and internal jugular veins in the supine and sitting positions. RESULTS: In the sitting position, flow decreases, both in vertebral veins and internal jugular veins, as the total vessel area decreases (from 0.46 ± 0.57 to 0.09 ± 0.08 cm2), even if the mean velocity increases (from 12.58 ± 10.19 to 24.14 ± 17.60 cm/s). Contrary to what happens to the blood inflow, outflow in the supine position, through vertebral and internal jugular veins, is more than twice the outflow in the sitting position (739.80 ± 326.32 versus 278.24 ± 207.94 mL/min). In the sitting position, on application of very low pressure to the skin with the sonography probe, internal jugular veins rarely appear to occlude. A pronounced difference of diameter between internal jugular veins was present in approximately one-third of subjects. CONCLUSIONS: Our results support the view that other outflow pathways, like the vertebral plexus, play a major role in the normal physiology of brain circulation and must be assessed to obtain a complete picture of blood outflow. However, the blood flow in IJVs is received from the superior sagittal sinus and the straight sinus via the transverse and sigmoid sinuses as well as from the cavernous sinus via the inferior petrosal sinus. After that, the IJV flow returns in the vena cava through the brachiocephalic trunk. With body position change, the outflow in IJVs appears to be mostly present in the supine position, whereas it is markedly reduced during standing position, with a tendency of IJVs to collapse9–11; at the same time, a concomitant flow rise in the VVs was seen. On this basis, most authors think that chronic cerebrospinal venous insufficiency simply does not exist,3,12 that findings previously reported in some patients can be a normal variant, and that other important drainage pathways such as the VVs and the vertebral plexus6,7 must be assessed. Because physiologic data on the cerebral venous outflow are scarce and obtained by the use of different techniques, we performed a study to evaluate the normal physiology of both the VVs and IJVs in healthy subjects by use of multigate color Doppler. The aim of this study is to investigate the physiology of IJVs and VVs in a cohort of healthy subjects with multigate echo color Doppler ultrasonography in the supine and sitting positions. In this study, 25 young, healthy volunteers were enrolled [12 men and 13 women; mean age, 27 years (range, 24–52)]. In all subjects, no IJV and/or VV lesions or previous catheter insertions in the IJV were reported, nor was a disease involving neck organs present. All patients underwent echo color Doppler ultrasonography examination of IJVs and VVs on both sides. Ultrasound examinations were performed by an expert vascular sonographer on all subjects' IJVs, and VVs were examined bilaterally from their distal part, connected to the subclavian and brachiocephalic veins, to the proximal part, represented by the presence of the mandible. Vessel area of the IJV was measured in the horizontal plane in the B-mode image at cricoid cartilage level. In the VVs, diameter measurements were obtained in the sagittal plane in the V1 segment, between the origin of VV and the intervertebral foramina, and the area was calculated by [(diameter of vessel/2)2 × π]. Venous blood volume flow (BF) (cm3/min) for IJVs and VVs was calculated as [(average velocity × area of vessel) × 60]. Morphologic and functional characteristics of both IJVs and VVs were investigated in the supine (0°) and upright sitting (90°) positions. Image acquisitions were performed by use of a MyLab 50 Gold sonography system (Esaote S.p.A., Firenze, Italy) equipped with a linear array transducer probe (LA332, Esaote S.p.A.; operating bandwidth, 3–11 MHz; imaging frequencies, 3.5–5.0–6.6–10.0 MHz; Doppler frequencies, 3.3–5.0 MHz). Each session started with the subject in supine position, and it then shifted to sitting position. A sufficient level of hydration of the subject during the 12 hours before the examination was recommended. A proper rigid head support was used to prevent hypo-extension or hyperextension of the neck and turning to the left or right side. A thick layer of ultrasound gel (Aquasonic 100; Parker Laboratories, Fairfield, New Jersey) was used to ensure a complete coupling between the transducer and the examined subject's skin to avoid black cones and dark areas on the ultrasound image and to prevent excessive pressure on the examined neck to preserve the IJV shape and dimension. Quality Doppler Profiles (QDP) is an innovative multigate spectral Doppler technology that processes the echo signals backscattered from multiple depths along the ultrasound beam, producing and displaying in real-time the so-called spectral profile.13 This is a matrix of power spectral densities corresponding to the simultaneously investigated depths.14,15 The spectral profile is obtained by calculating, through the classic Fast Fourier Transform algorithm, the Doppler spectrum of 128 samples, gathered from 1 depth and by repeating the procedure over 128 or 256 consecutive depths (covering a total length of 5 cm). As a result, the QDP approach extends the known benefits of spectral analysis16 to a large depth range without sacrificing the axial resolution. QDP technology investigates the “third dimension of Doppler” in a graphical form, in which spatial distribution is on the vertical axis and velocity on the horizontal one; the brightness of any pixel describes the power of the corresponding spectral attenuation. In this way, QDP enables the simultaneous analysis of different vessels (and different blood flow components within the same vessel) in real time without frame rate loss. The shape and the weight of the transducer are ergonomically important to preserve the sonographer's comfort and musculoskeletal integrity while scanning. The linear probe used for the above examinations was designed to be gripped in different ways to release the muscular effort on the wrist and on the hand during the scanning session. The longer the duration of the examination, the more useful was the possibility of changing the probe grip: the average time for the performed scanning was 40 minutes. Furthermore, the so called “palm-hold” eased the correct orientation of the probe during transverse scanning to avoid the Doppler spectrum mirroring effect obtained when the transducer was perpendicular to the blood flow. Vein compression had to be completely avoided to preserve vein dimensions and hemodynamic characteristics: even a small external pressure can cause a huge collapse of the IJV. This was facilitated by the low probe weight (80 g plus 170 g for the entire cable). The probe used in the examinations had a tip dimension of 33 × 8 mm, with an externally mounted soft silicon acoustical lens without sharp angles to avoid uncomfortable contact in the scanning area for the examined subjects. For statistical analysis, we used the Student t test for paired samples to compare differences of area and BF between supine and standing positions. A P value of <.05 was considered significant. Mean and standard deviation (SD) of cross-sectional area and BF of both IJVs and VVs in supine and standing positions are shown in Tables 1 and 2. The area ratio between the right and left sides, in supine position, was ≥2 in 9 subjects (36%) for IJV and in 15 (60%) for VV (Table 3). There was no significant side difference between the cross-sectional area and blood flow either in the supine position (P = .9 for IJV, P = .8 for VV) or the sitting position (P = .9 for IJV, P = .7 for VV). Instead, body position influenced both the cross-sectional area and BF: in fact, a reduction of 430.61 (64.6%) and 30.25 (41.0%) mL/min was present in both IJVs and VVs, respectively; however, the difference of BF was statistically significant (P < .01) only for IJVs. The reduction of total BF (IJVs + VVs) between the 2 body positions was 461.56 (62.4%) and was significantly different (P < .01). BF in both IJVs and VVs was more modulated in the supine position than in the sitting position (P < .01) (Fig 1). The pulse wave analysis shows how signal in internal jugular vein is more modulated in supine position (A) than in standing position (B). In each frame, both the internal jugular vein (1) and the external carotid artery (2) are shown. Because the arterial BF passing from the supine to the sitting position is slightly reduced19 or increased,20 additional paths of cerebral outflow should be strongly considered. We found that the area of IJVs and even VVs is different between the 2 sides of the neck, that the BF is asymmetric in many patients, and that the BF in IJVs is more modulated in sitting than supine position. In a similar study conducted by Valdueza et al,11,21 who examined the postural dependence of cerebral venous outflow through IJVs and VVs in 23 young healthy adults by use of color-coded duplex sonography, measurements were taken with the body at 0°, +15°, +30°, +45°, and +90°. The authors found that in IJVs, BF was reduced, whereas in VVs, it was increased when the subjects moved from a 0° to a 90° position; however, this increase was not sufficient to compensate for the drop in jugular flow, therefore, total BF was significantly reduced. In the sitting position, half of the IJVs collapsed completely and had no flow visible (23 of 46 vessels); in 9 (39%) subjects, the flow was absent in both IJVs. These last data are not confirmed by our study; we think it is because of the increased accuracy and sensibility of modern machines as compared with the ones used in the previous study and in the technique that we used to avoid compression of the partially collapsed jugular veins. Moreover, we found that BF in VVs was reduced with the body at 90°; we think it could be explained by the different point of BF sampling because we recorded VV BF in V1, between the origin of the VV and the intervertebral foramina, where the vein diameter is more likely to change than in the rigid V2 section. Moreover, a different regulation of the pulsed Doppler filter could in part explain these differences. Alperin et al18 conducted a study on 10 volunteers by use of an MR imaging technique to assess effects of posture on intracranial physiology. The study showed that a shift of the venous outflow from the IJVs to secondary venous pathways occurred in the upright posture and was also less pulsatile (57%). Our study confirms variations of pulsatility of BF in the 0–90° body position by use of the echo color Doppler ultrasonography technique, and our BF measurements are similar to those obtained in this study. We found considerable side differences of IJV BF, in agreement with other studies by use of different techniques, including MR imaging, PET, and echo color Doppler ultrasonography,22 and this can be explained by a frequent side dominance of venous drainage.23 Again, in accordance with the previous studies, we found a right IJV outflow dominance. The existence of different outflow pathways can also play a role because they can have a different effect in different subjects. 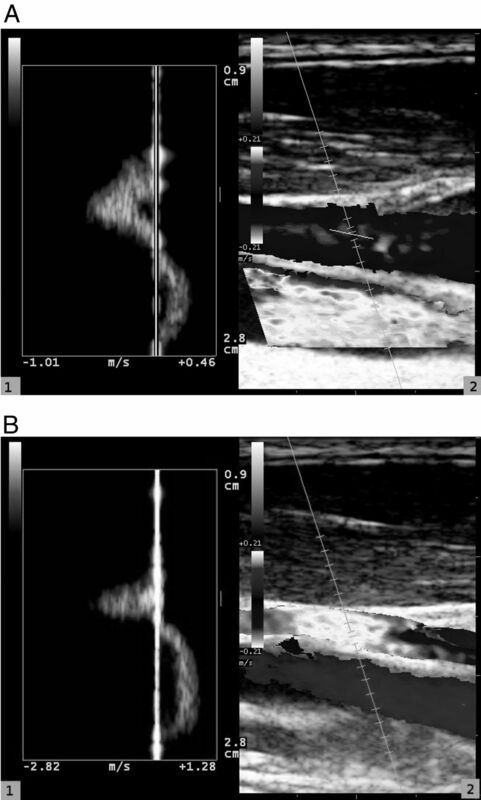 Echo color Doppler ultrasonography can easily be used to evaluate not only the IJV diameter differences but also the flow and flow patterns and probably can be used as a sophisticated guide to evaluate which IJV can be used for intravenous infusion devices. In contrast to other studies, we verified that the IJV rarely occludes during the sitting position: it is not simple in this position to examine the neck, and in particular, the IJVs; it is easy to compress the IJV under the probe, so it is important to be careful and to have adequate support and an abundant quantity of ultrasonic gel to avoid the IJV collapse. We found that QDP technology, which is able to elaborate the Doppler spectrum along all the vessel lumen, showing the spatial distribution, the velocity, and the power spectral attenuation in real time, was useful to give us a qualitative idea of how the diameter of the vessel and the velocity inside it varied with time and with the position of our subjects (Fig 2). 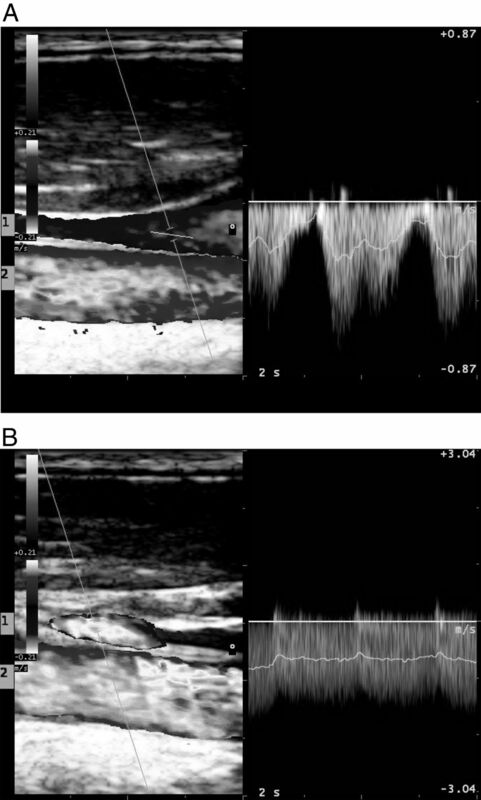 Blood flow in internal jugular vein analyzed by use of QDP technology (1); reference image shows internal jugular vein and common carotid artery (2). Internal jugular vein is analyzed both in supine position (A) and in standing position (B). According to our data, cerebral outflow changes with body position, diminishing to less than half in the IJVs and in the VVs, and the increase in mean flow velocity is not sufficient to compensate for the decrease of the cross-section of these vessels in the upright position. Because arterial inflow is not so dramatically diminished, alternative outflow pathways must play a role and must be studied if any conclusion must be drawn from cerebral outflow impairment. Because the suspected pathway is the venous plexus, which is situated inside the vertebral channel, sonography methods that are impervious to thick bone are probably inadequate to study such an anatomic structure. The large difference that exists in a large number of subjects between the IJV area in the 2 sides of the neck makes the study of only 1 side poorly suited to draw firm conclusions and suggests that a sonography study of both veins could be useful to choose which side to use for the insertion of intravenous devices. Disclosures: Leonardo Forzoni—UNRELATED: Employment: Esaote S.p.A., Comments: I am an employee of Esaote S.p.A., the company that implemented the QDP technology used in the study. Authorship details: G.C., concept and design of the study, analysis and interpretation of data, critical writing and revising of the intellectual content, final approval of the version to be published; D.R., concept and design of the study, analysis and interpretation of data, critical writing and revising of the intellectual content, final approval of the version to be published; L.F., concept and design of the study, analysis and interpretation of data, critical writing and revising of the intellectual content, final approval of the version to be published; A.F., analysis and interpretation of data, critical writing and revising of the intellectual content, final approval of the version to be published; A.M.P., critical writing and revising of the intellectual content, final approval of the version to be published.